Three times more journalists have been killed in Iraq than in both world wars - many deliberately targeted by militias. There were a number of "landmarks" in Iraq in the past few months: the Petraeus report into the US army's "surge"; the withdrawal of British forces from their last base inside Basra city; the decision to bring security companies under the law following the incident involving guards from Blackwater. But one landmark which passed virtually unnoticed was that the Iraq conflict has become the deadliest by far for the media trying to cover it, with more than 200 journalists killed to date. To put this in perspective, two were killed in the First World War, 68 in the Second, 77 in Vietnam and 36 in the Balkans. And the toll in Iraq shows no sign of declining. It is, if anything, rising. Five journalists were killed in separate attacks in just one day last month. "Covering Iraq," says Chris Cramer, the president of CNN International, " is the single most dangerous assignment in the history of journalism." Some famous journalists have lost their lives reporting conflicts - Robert Capa in the first Indochina war; Ernie Pyle on the island of Okinawa in the Second World War; Larry Burrows in Vietnam. 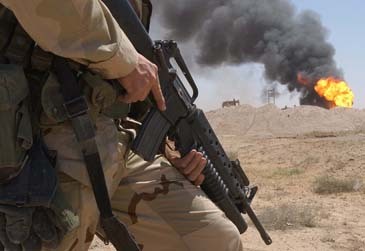 But what makes Iraq more dangerous than the others is that the deaths are not accidental collateral damage from stray shells or from reporters being caught up in the fighting. Instead, many have been specifically targeted because of what they had reported or because they came from the wrong side of the sectarian divide. They are killed in drive-by shootings or abducted and executed, often after being tortured. There are little or no investigations into the attacks, creating impunity for the killers from the Shia or Sunni militant groups or government run death squads. The deaths have not come just from those quarters, about 15 reporters have been killed by US troops, six from Reuters alone. There is a feeling among Iraqi journalists that the reason their plight receives so little attention is because the majority of those affected are not members of the Western media. On the occasions when the victims were, in fact, foreigners, the scope of coverage was glaringly different. It would be unfair to suggest that the few foreign journalists left working in Iraq have anything less than great empathy for the Iraqi journalists working with them. Photographs of those who have fallen in the conflict are displayed on walls of the bureaux of The New York Times, The Washington Post, Reuters and other news organisations. Their families receive generous financial settlements and have, at times, been helped with resettlement abroad. It is undoubtedly the case that the media organisations have behaved towards their staff much more honourably than, for instance, the British Government has towards the translators employed by the military in Basra. There is always the question of whether some of these journalists may have remained alive had they not been involved with the foreign media. It is something that is difficult to judge in a society experiencing extreme violence. John F Burns, until recently the Baghdad bureau chief of The New York Times, wrote, after the death of Khalid W Hassan, an Iraqi of Palestinian extraction, that "the murderous turmoil in Baghdad has reached a point where many families never know the killers of their loved ones, or their motives. Sunni insurgents? Shia militias? Killers who mimic one or the other while pursuing more private motives of greed, spite or revenge? Or, in Mr Hassan's case, the nature of his employment, which placed him doubly at risk: as an Iraqi journalist, and as an Iraqi working for Americans?" Nour al-Khal, a very brave female journalist I worked with in Basra, was abducted by armed men in Iraqi police uniforms. She was with an American reporter, Steven Vincent. Both were shot. Vincent was killed and al-Khal dumped by the roadside, left for dead. Vincent had been writing about how the police in Basra, who were heavily infiltrated by Shia militias, had been acting like gangsters, and that may have sealed their fate. What happened showed that the gunmen feared no repercussions from kidnapping and killing an American, let alone an Iraqi, in the middle of Iraq's second city, then supposedly under British control. Similarly, when our hotel in Baghdad, the Hamra, got blown up by suicide bombers, there were claims that the attack had been ordered by a senior member of the government who had got fed up with foreign journalists writing about the death squads he ran. "He tried to blow us up just because he didn't like some stories we are writing," a colleague said in wonder. "Even Alastair Campbell at his worst wouldn't have done that." Last Wednesday evening at London's Frontline Club, this year's Kurt Schork award, in the memory of the journalist killed while covering events in Sierra Leone, was given posthumously to an Iraqi reporter. Sahar Hussein al-Haideri, 44, was gunned down in Mosul, in the north of the country, five months ago. Her killers are thought to be from the Islamist group, Ansar al-Sunna. In such a place where life remains so cheap and death is meted out brutally and casually, the media will remain exposed to danger and it is the Iraqi journalists who will continue to pay the ultimate price.